The 5.8 Ghz receiver helical antenna will give a better distance for video reception on 5.8 Ghz frequency, this is a commonly used video transmitter frequency used for First Person View flying. The helical antenna is mounted inside a protecting plastic case to protect the shape and design of the antenna and is only 20 grams. The advantages of using the helical antenna is a higher gain over normal SpiroNet antennas and patch antennas, the gain of this helical antenna is 14 dBi and is supplied in the left hand polarisation. The base of the antenna is copper to give the highest sensitivity. 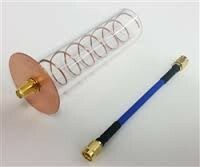 The helical antenna is supplied with a 10cm extension cable and low loss adapter.